Denny Jump (Bellevue, WA, United States) on 26 January 2012 in Landscape & Rural and Portfolio. Perfect tree for your sun shot. Lovely, and same to you, my friend. This is glorious, Denny . . I feel the warmth ! @Ronnie 2¢: Thanks so much, Ronnie ;-)I love your post for today ;-) Hell, i love ALL of your posts!! This is a very strong shot, a perfect black silhouette, nicely exposed Denny. Fantastic! I love that light and the beautiful outline of the tree. Thanks for the good wishes and for sharing your work with us. Thank you Denny! Marvelous shot and your images full of optimism always brighten my day. Great silhouette against this sky - and thanks for the blessing! @Doug: HiN Doug- Thank you very much, sir!! @Eric Cousineau: Thanks so much, Eric - Much appreciated! Oh perfect, perfect perfect!!!! I just love this! And may the sun forever shine on you too! @CElliottUK: Thank you so much, sir ;-) All the Best! What a glorious morning image ... I love the huge, silhouetted tree! @Judy aka L@dybug: Hi Judy - Thank you..This is just down the street ;-) All the best! Your photo is magic ! Hope it will shine for you too Denny ! Very nice picture of that backlighted tree ! 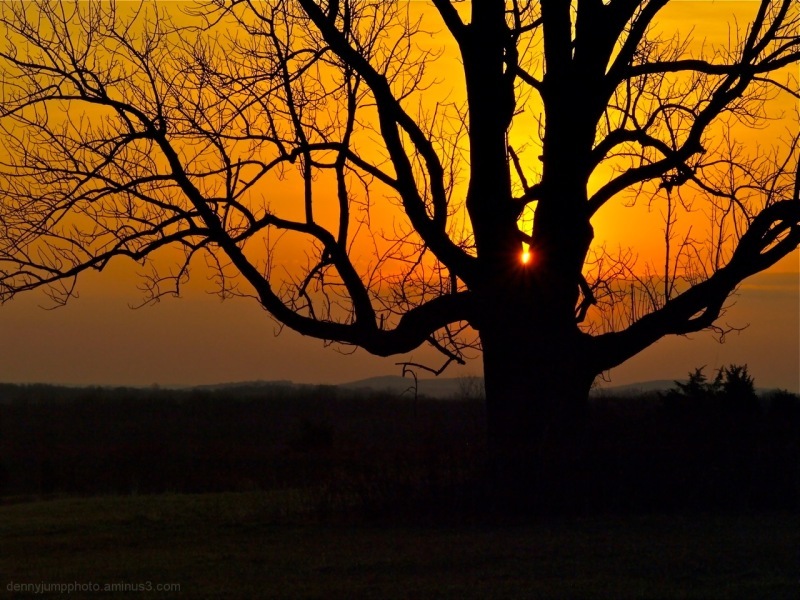 Beautifully composed with an ideal-shaped tree as a silhouette for the sun. How the sun's rays were captured seem to give the illusion that the sun is moving in this composition. Well done! The silhouette of the tree against the orange sky with the sun peaking through at the trunk is fantastic! Beautiful composition! Denny this is fantastic and warms the soul, very well done! Outstanding shot. Colors and the dark tree silhuoette are really wonderful. Well done!!! Delectable! The tones are so warm and beautiful, and your framing is impeccable with that sun just peeking through the tree limbs. An awesome image to bestow upon your Aminus friends, and for which you have my thanks. I'd color spotlight this in a heartbeat. Very nice! Love the color and the backlighting. Thank you Denny! This is one fantastic capture with the perfectly placed sun rays. This is a book or CD cover! Denny, thank you for your lovely sentiment and it is with such a gorgeous image! Stunning! !